Eating at Kitty Burns is like having your Melbourne brunch as an extra in a utopian 80s film. In what feels like a nod to the Memphis Group, Kitty Burns' interior design incorporates pastel mint walls, blonde Scandinavian timber and a forest-load of greenery to create a clean space so close to nature it somehow feels unnatural. 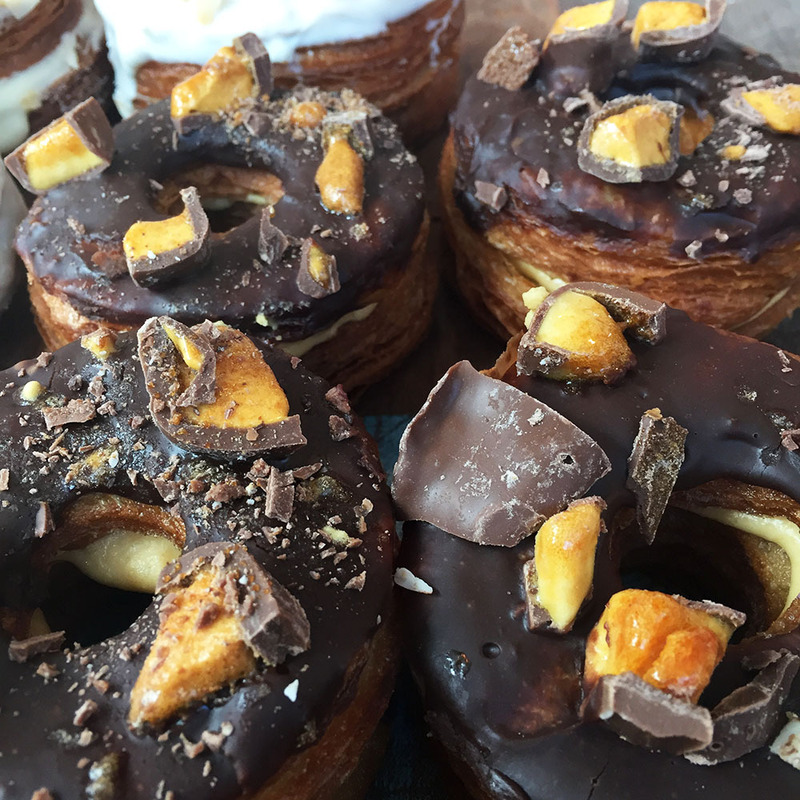 Too many flavours of cronuts to choose from. 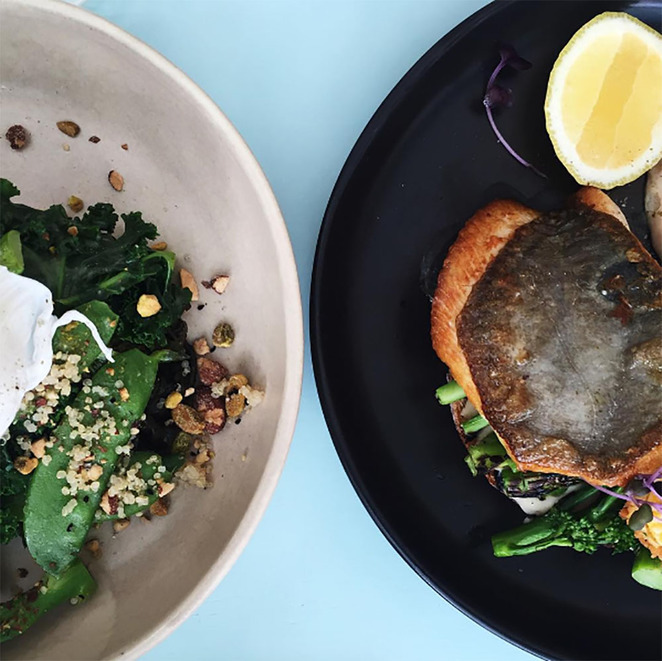 Set amongst the idyllic 'Eden on the River' complex in Abbotsford and, the café's floor-to-ceiling windows look out on the overly planned landscape, complete with timber walkways and native flora; a mini rainforest amidst the city. The cruffin cabinet. A croissant and a muffin...one day. Inside, timber frames create houses over the coffee counter, an interesting juxtaposition of a house inside a room filled with indoor plants - perhaps commenting on the insular nature of the inner city dwellings we hardly leave. Copper light fittings add a touch of opulence less ostentatious than gold, beautifully complementing the simple colour scheme of black, white, pale timber and pastel mint. But enough about Kitty Burns' interior design. Almond Milk latte with house made almond milk. I ordered a latte built over house made almond mylk that tasted creamy and divine. Personally, I have stopped drinking nut mylk unless it is made on the premises or delivered by a reputable company, as the long life stuff tastes terrible. Kitty Burns have a wide selection of house made nut mylks including almond, coconut and hazelnut at an additional cost of $1-2. 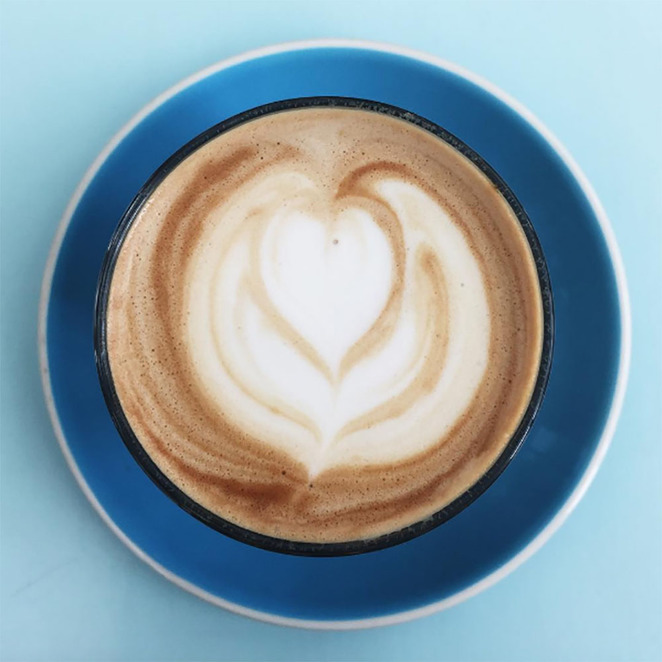 They have a huge selection of beverages on offer, from hipster smoothies (you know the kind: raw, vegan, gluten free with bee pollen and chia seeds) to Red Velvet Beetroot Cacao Lattes and Bulletproof coffee. Surprisingly fluffy for a donut. Unfortunately, I went straight for my standard boring coffee instead of trying something weird, as they never give you enough time to actually read the menu when you first sit down before asking if you'd like a drink. The Kitty Greens with a poached egg. Not my first option - a little too healthy! 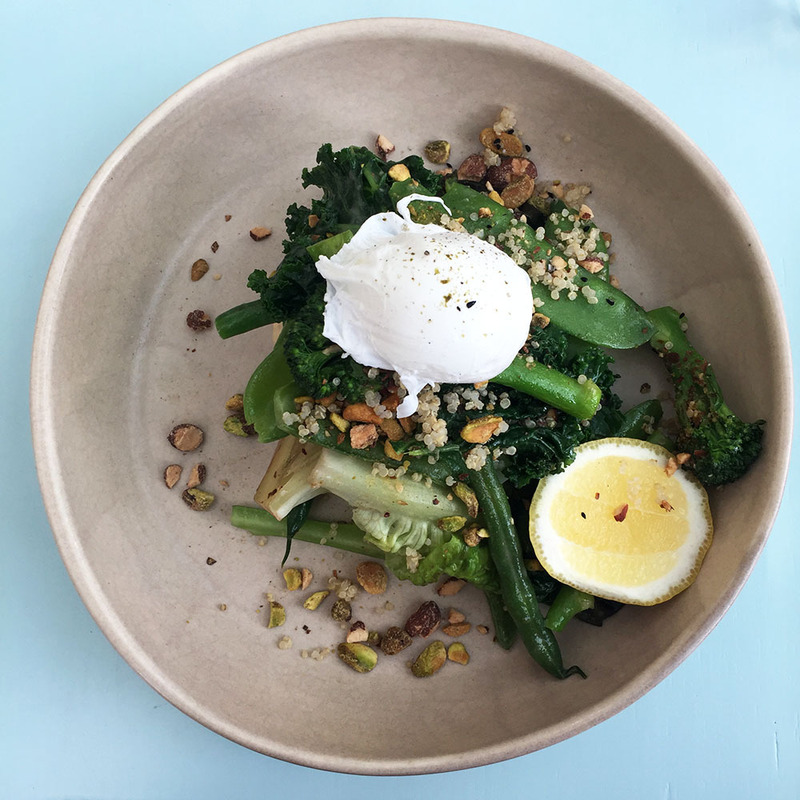 The menu, while labelled 'All Day', is basically just hella fancy brekky (which I'm totally cool with – best meal of the day). I was super keen for the Omelette with local prawn and crab, but unfortunately at 11am on a busy Sunday they were all sold out! I went with the Kitty Greens with a poached egg instead, and it was a little on the too healthy side of things, if you know what I mean. 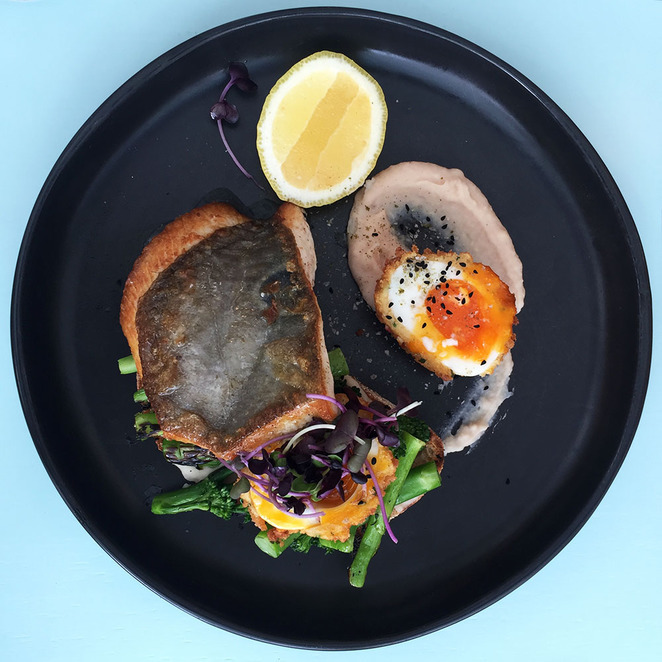 John Dory with a panko crumbed egg. 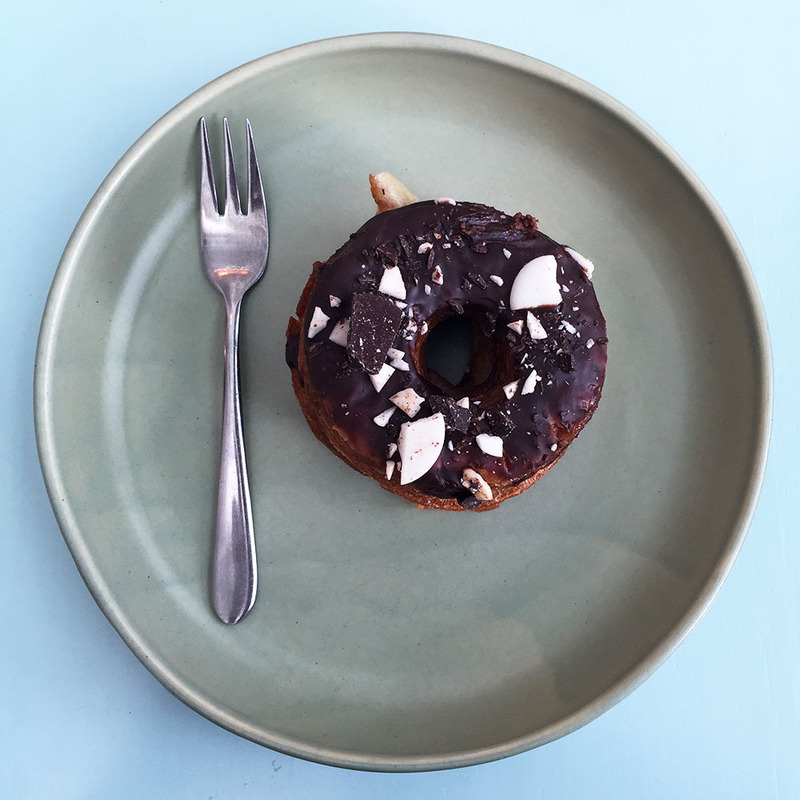 The triple chocolate cronut before we split it. White, dark and milk chocolate mousse...delightful. We ended up having another coffee and splitting a cronut. They have an entire cupboard filled with the bizarre things, and it took us a while to choose the right one. Out of coconut, salted caramel, raspberry & white chocolate, and blackforest, we went with triple chocolate. 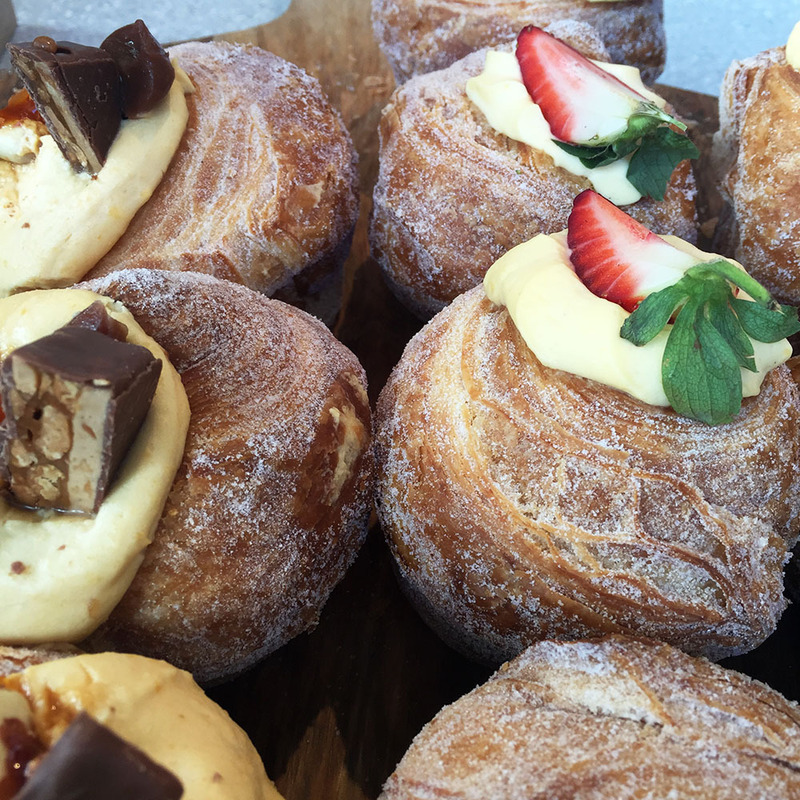 Salted Caramel Cronuts with crunchie on top. 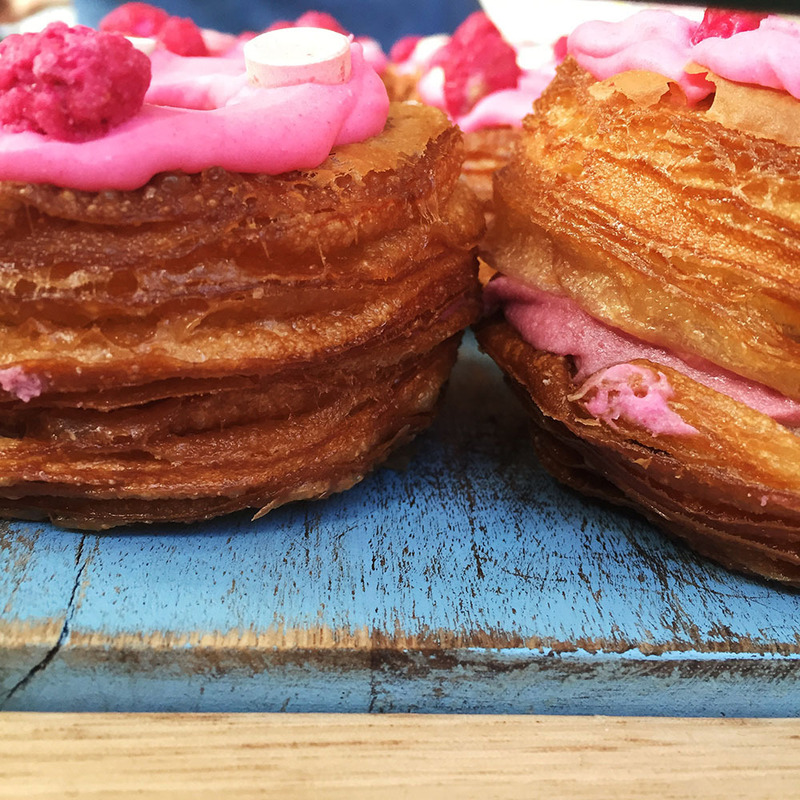 I've never had a cronut before, but it is the strangest of Frankenstein's kitchen monsters I think I've tried. It basically tastes like a flaky, twice-fried donut smothered in chocolate mousse, and I mean that in an "OMG!" kind of way. Read: they're good. NB: The only letdown to the entire Kitty Burns experience (and not really the café's fault) was the parking situation. When you turn into Acacia Place, you don't quite realise that the street turns into an underground, private car park run by CAREpark. The issue here is that the only thing they seem to care about is revenue raising, and they've employed car parking attendants to watch your pre-paid ticket like vultures hovering around starving patrons. Both my friend and I ended up with $66 'invoices for damages' for staying 3 and 12 minutes overdue respectively (when the actual cost to them was more like 35 cents). Pretty annoying, and I strongly recommend parking over at Victoria Gardens and buying something from IKEA for free parking instead. They sound like an odd contradiction of healthy and deep fried, must be couple pleasers. Just looking at those photos makes my muth water. What an amazing place and thanks for the parking tips. 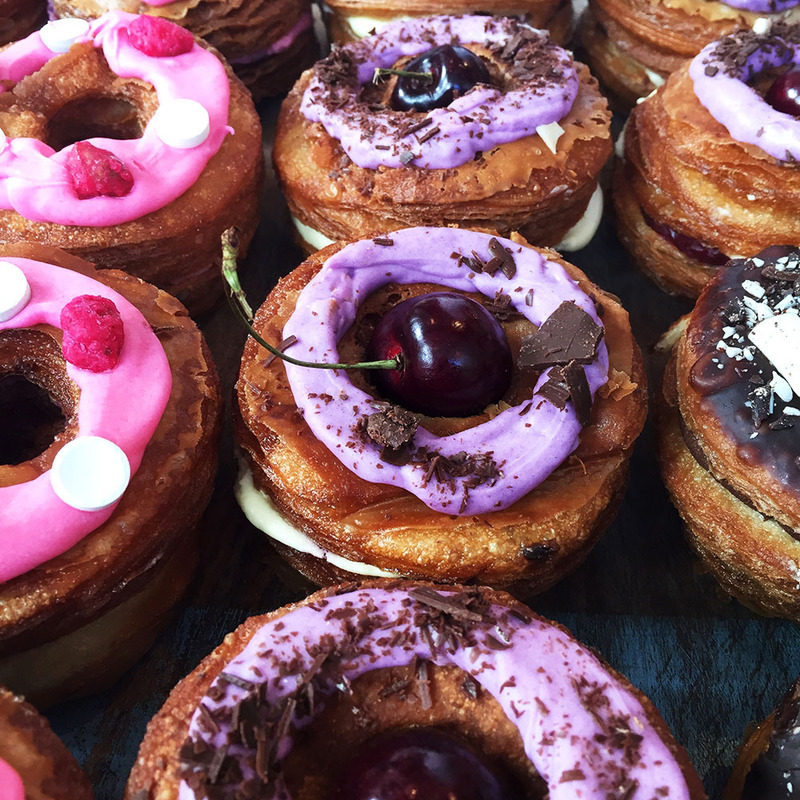 The cronuts are to die for, loved them so much! An omelette with prawn and crab sounds too good to be true!